Michigan wild garter snakes, also called eastern or common garter snakes, are among the most common species of snakes in America. They occur all throughout the United States and Canada; isolated groups are found as far south as Mexico. Michigan's variety of landscapes and closeness to wet habitats attract the snake to live and mate in these areas. Michigan wild garter snakes vary in appearance, in terms of coloring and scale shading. Their scales are typically black, brown, olive or gray, with three yellow stripes running along the body. These snakes' heads are larger than their bodies. The undersides of their chins match their yellow stripes. Garter snakes grow no more than 4 feet long, with males being shorter than females. Newborn and juvenile garter snakes are similar in appearance to adults. Garter snakes are adaptable creatures, found in a variety of landscapes. 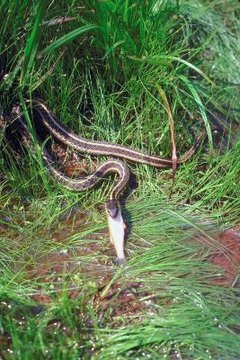 Michigan provides garter snakes with such a variety, including marshes, grasslands and woodlands. These reptiles prefer to live in moist areas, such as around swamps, lakes or streams. They are found living under sheltered areas composed of vegetation, debris or rocks, and come out to mate, hunt or sun themselves. Garter snakes are active mostly during the day. They are often found sun bathing on warm rocks to maintain body temperature. From October to March, garter snakes hibernate in mammal borrows, natural cavities or stumps to avoid cold winter conditions. Although they are solitary creatures, they will coil together with other snakes to stay warm. Garter snake life span averages 10 years. Garter snakes eat a variety of creatures, including insects, salamanders, frogs, toads, crayfish, slugs, leeches, worms, baby birds and other smaller snakes. They are excellent hunters due to their increased ability to smell and see prey, as well as track movement through vibrations they feel on the ground. They hunt using several different techniques of stalking quickly and hovering their upper bodies above the prey. When ready, they strike with their teeth, which emit saliva that toxic to some smaller prey. They swallow their prey whole. When ready to mate, females use their tongues to read pheromones, or scented chemicals, expelled from males to choose a suitable mate. Once females find the right mate, her young are incubated about halfway down her body for up to three months. Females typically give birth to 10 to 40 young per litter over the summer to early fall. The number of litters depends on the size of the female. Once born, the newborn snakes are on their own to hunt and find shelter.